Last week, we were happy to find more leaks and rumors about future Android devices. With the release of the new mobile phone, Samsung may once again become the runner-up of the best smartphone manufacturer. We are not talking about Samsung smartphones today. We are talking about its protective case, because the price of Galaxy S10 or Galaxy Note 9 will be very high, so we must take protective measures. These are the best Samsung Galaxy S10 Plus wallet cases that protect your phone and let you carry less at the same time. Whether you want to change your wallet or just put a bulky wallet at home, it is highly recommended to use a wallet phone case. Some people need more space and slots to carry a lot of the necessary wallet cards and some money. For those looking for practicality and more space, use the CaseMe wallet case for the Samsung Galaxy S10 Plus. This case has some unique features. 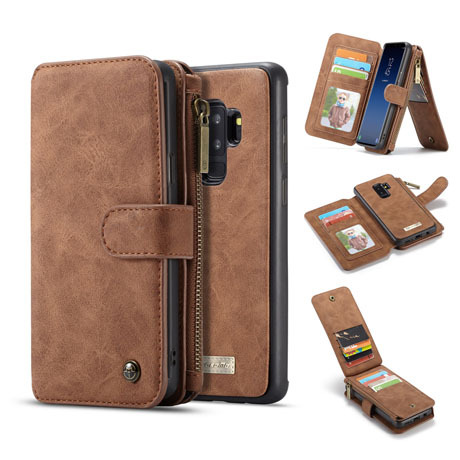 The Galaxy S10 Plus leather wallet case is a high quality cowhide hand-slip leather wallet with a vintage look and a 2-in-1 detachable design. The business-sleek exterior offers a magnetic internal hard PC case. And this magnetic suction inner layer provides excellent separation of the inner shell. There are multiple card slots and purses. CaseMe also launched the Samsung Galaxy S10 wallet case and the Samsung Galaxy Note 9 wallet case, which you can find on the Official CaseMe website.